Ducati Patent Application Pointing To Future Street Bike? “Frameless” motorcycles utilizing the engine not only as a “stressed member” of the frame, but as an integral or linking, member are not new (remember the Britten, for instance?). 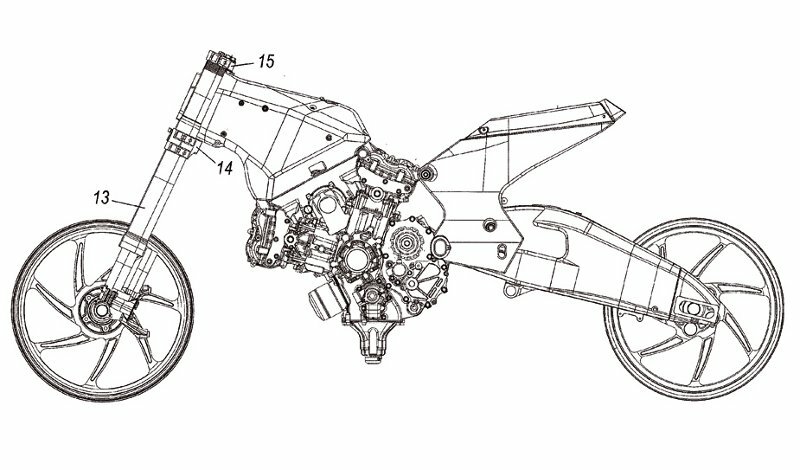 Nevertheless, we find it interesting that a patent application by Ducati filed early last year, and published on December 17, 2009, features this frame and engine configuration. On the face of it, this may be simply a race bike resembling the MotoGP Desmosedici, but the effort to protect the design with patent applications filed in the United States and overseas strongly hint at a future street legal machine. Perhaps, a new limited edition Desmosedici for the street. It should be pointed out that this design is not neccesarily optimal for a street bike. Not neccesarily lighter, for instance, because the integrated engine must be far stronger, and heavier. In addition, certain maintenance operations become much more dificult, such as removal of the head to service the valves or other engine components necessitating, essentially, partial disasembly of the frame pieces.